Davide Grazioli (Milano 1972) is an artist with a nomadic approach moving through the most diverse media, ranging from painting to embroidery, from sculpture to video, sometimes even trespassing the border with fashion design and social art. The focus of his quest might be perceived, broadly speaking in the journey itself. And right as the journey erodes a part of the traveller’s personality in order to let him/her absorb the other and the elsewhere, Grazioli’s ever changing work seems to incorporate many identities. Therefore the composite identity of this artist is not merely related to his geographical background in the traditional sense but it is more appropriately related to his diverse and distant experiences and to the choice of releasing his works each time in different places. In 1998 he becomes assistant of Aldo Mondino (Turin 1938-2005) This encounter stimulates even more Grazioli’s love for the Orient and this constant search for ambivalence and ubiquity leads the artist in the early 2000 to begin his won quest about the great transitions he witnessed while travelling, whether they are cultural, spiritual, or environmental ones. Grazioli seems to be raising questions about what is going to be destroyed and what is going to be spared in the hectic contemporary living, constantly defying the concept of border and identity. From that moment on the assimilative and inclusive artistic approach that Grazioli has developed thanks to his constant deplacements, led him to face trans-cultural themes in which the media he uses are a part – often unrepeatable – of the single series of works. This is the case of a work about – and together with – the “hoarding painters” of Chennai (Tamil Nadu, India) in which the artist co-operated with a group of craftsmen destined to loose their jobs crashed by the arrival of new digital advertising printing techniques. This work aimed at detecting the threshold between past and future. The clash between fragments of apparently incompatible realities, as urban versus forest life, emerges again in a work of 2005-2006 in which the artist portrayed the endangered species by creating a series of burnable organic incense sculptures gathered in a ritual-like installation entitled “Sanctuary”. Or again when working with a team of Muslim embroiderers he released a series of flags portraying tigers for an installation entitled “Prayer for the tiger” citing the Buddhist prayer flags. Highlighting once again the theme of impermanence and transiency a series of unraveled embroideries has been completed at the end of 2006 in Vietnam. Here delicate images of sacred trees, ascetics and animals carried the signs of a violent aggression. Grazioli moves to Berlin in 2007 , but he continues communting back and forth between India and South East Asia where he works and exhibits. 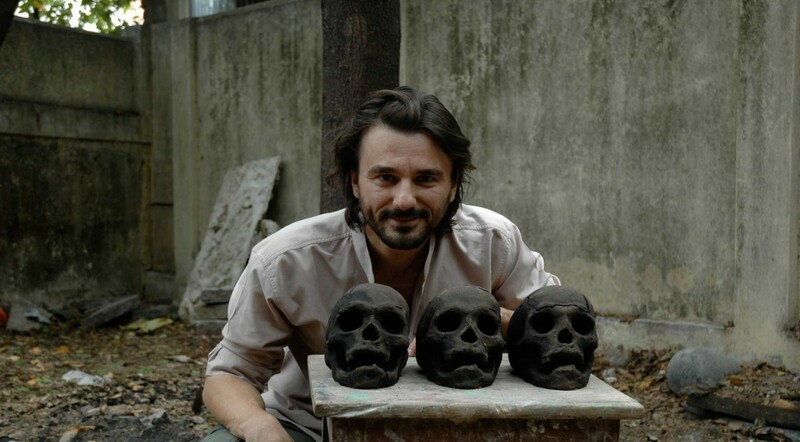 The themes of environment and sustainability gain again the center of Grazioli´s work in 2007 when, after suffering a severe asthma attack caused by extreme pollution he presented in India the installation entitled “Before we go” in which thirty-three human skulls made of organic incense, gold and myrrh lay on hundreds of lotus flowers. It is also related to the environmental issue the first video of this artist entitled “Waste” released in December 2007 as well as the series of unraveled embroideries of the year 2008 that display geographical maps, oceanic currents, Arctic and Antarctic Circle, plants and fishes which just got over an aggression threatening to destroy their image. But the sense of loss is not the only result of this continuous observation of the changing world. It is at times present in Grazioli’s works a sense of fertility generated by the constant exchange between East and West, past and present, spirituality and materialism. His passion for fabrics and his experience in experimenting with organic and recycled materials and colours led him to cooperate earlier in India with Prabha Nagarajan (Director of Organic Exchange India) and since 2008 in Africa as a fashion designer for the creation of Banuq an eco-sustainable and fair trade fashion label. The very first Banuq collection was developed by Davide Grazioli in cooperation with Mauro Pavesi and Marina Spadafora and was presented at AltaRoma Catwalk (Rome) and at World Congress of Organic Cotton (Interlaken-Switzerland) an event made possible by the cooperation between Helvetas and ITC (International Trade Centre an operational organization of the UN). In 2011 Banuq went through a transformation and became the first made in Italy, low-mileage and organic collection focusing on Menswear under the new name of Atelier Awash. In 2013 he moved from Berlin to Udine. In 2016 Grazioli released a new series of unravelled embroideries together with his ‘up-cycled Field Jackets’ , portraying the usual overlapping of spiritual and environmental subjects. From 2015 the interest of the artist on the themes of awareness and awakening of the innate self led him to attend the Process Counseling Master SPC of Triest and since 2016 he attends the Somatic Experiencing triennial course to become a pratictioner in trauma healing. His aim is hosting and leading art therapy oriented workshops where art becomes the facilitating environment for the individual and the community towards change. Davide Grazioli He lives in Udine where he also cooperates with Process Counseling School and DOF consulting as a Facilitator and Trainer. Since 2016 he actively joined the DMAV Social Art Ensemble.